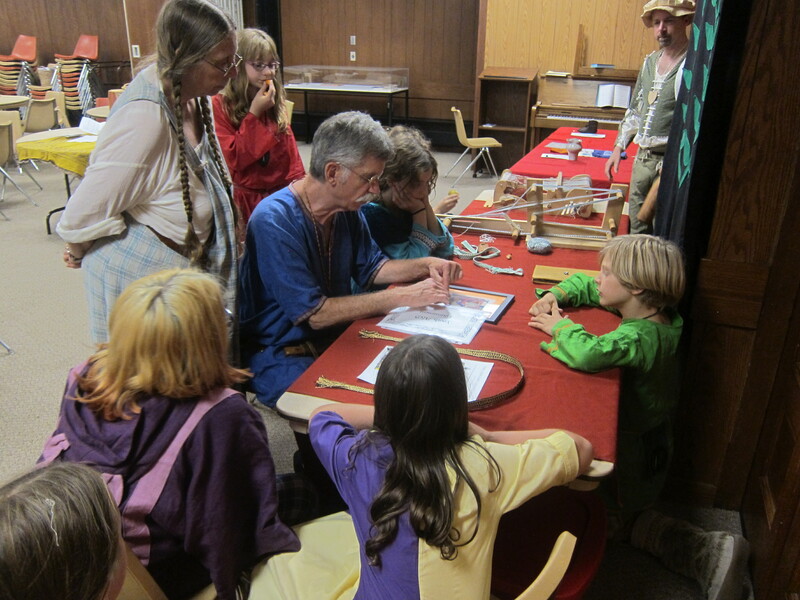 As part of its focus on the the Arts & Sciences, the Dark Ages Skóla (organized by the Dominion of Myrkfaelinn) also hosted both a Dark Ages-themed A&S Display and an unthemed Youth A&S Tournament. 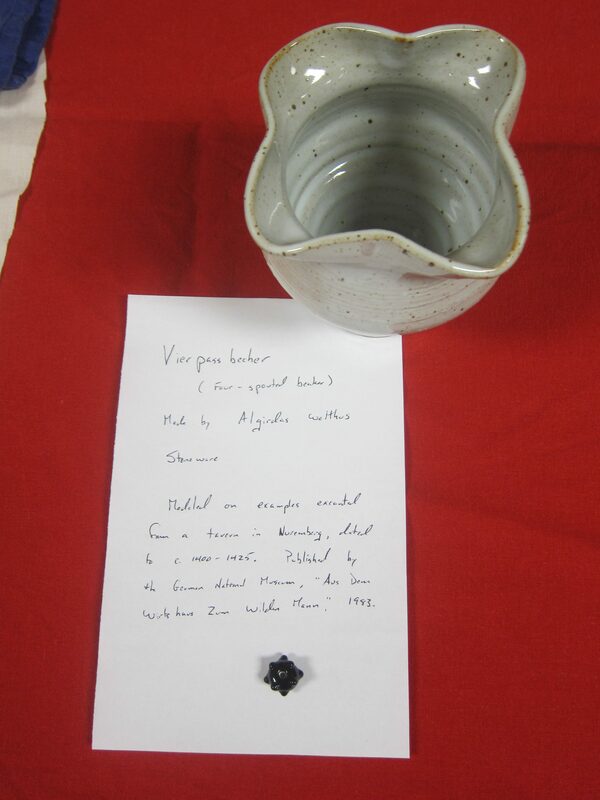 Both displays were situated in the main hall and enjoyed many visitors throughout the day. Thank you all for participating, and we’re looking forward to seeing what you’ll come with next! 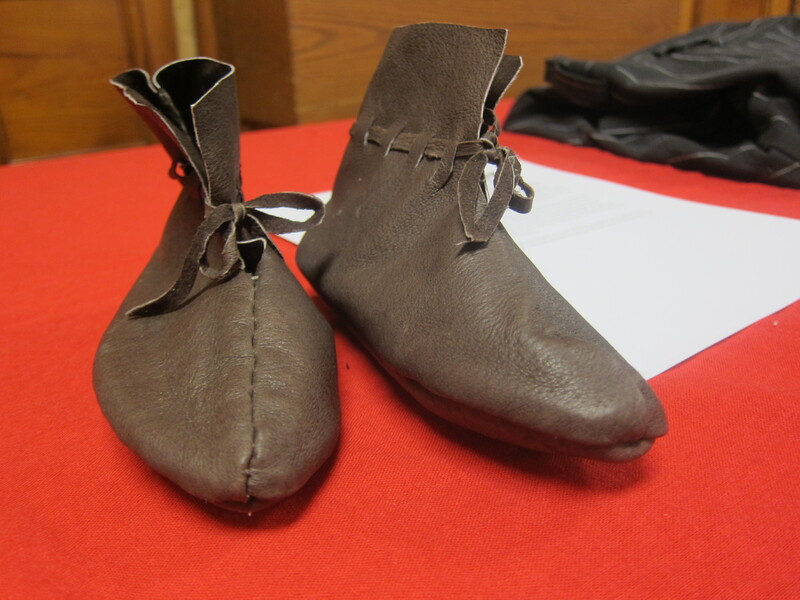 Hedeby shoes for a youth by Abigaile Kelloge. Abigaile writes: “The Hedeby shoes are based on a boot found in the excavation of that Norse settlement, 8th to 11th century Germany. They are similar to boots located in the Viking ship Museum in Oslo, which were grave goods from a ship burial of around 900 CE. This pair of kid’s shoes is based on a pattern from the Internet and are made from lightweight leather, handsewn with waxed nylon thread, with a machine sewn wool insole for comfort.” She did not anticipate how well loved the shoes would be come in the few weeks between events and when he’ll outgrow them, so she did not decorate the edges. 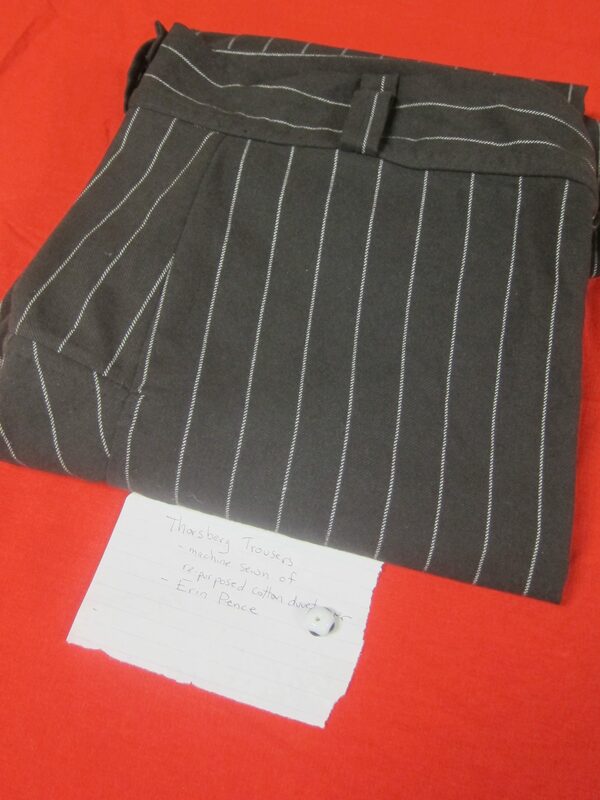 Thorsberg Trousers, machine sewn from a repurposed cotton duvet cover, by Erin Pence. Vierpass Beaker (four-spouted beaker) stoneware by Algirdas Wolthus. Algirdas comments: “Modeled on examples excavated from a tavern in Nuremberg, dated to c. 1400 to 1425. Published by the German National Museum “Aus dem Wirtshaus zum Wilden Man”, 1983.” He made several of these beakers and often uses them in his feast fear. 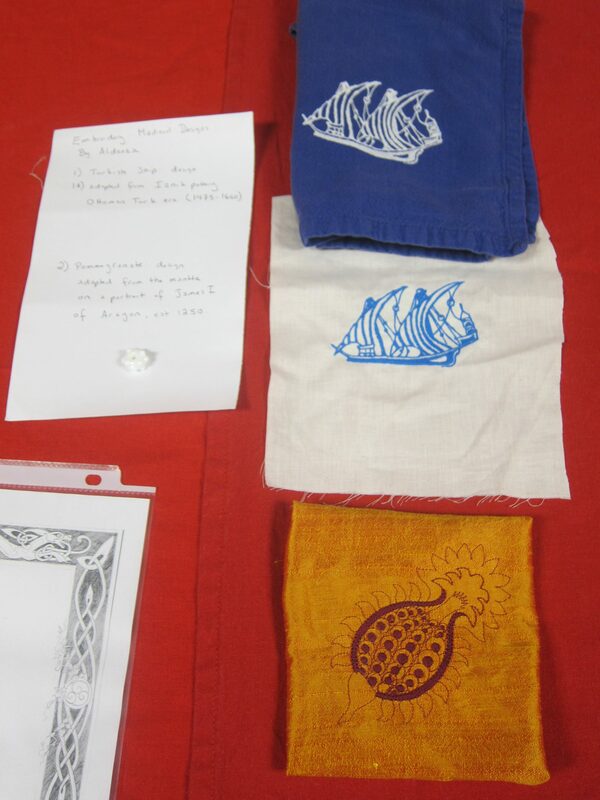 Machine-embroidery samples in preparation for a medieval silk outfit, by Aldeeza Wolthus. Katriona Iainsdottir entered a leather cover book with handmade paper inside. Cornelia entered an inkle woven shoulder strap made of gold and black. Sungiva entered an inkle woven belt, and a second one she was working on. Simon entered an illumination on parchment he was working on. Konrad entered a weaving he is working on. Galen entered a macrame bracelet he was working on. 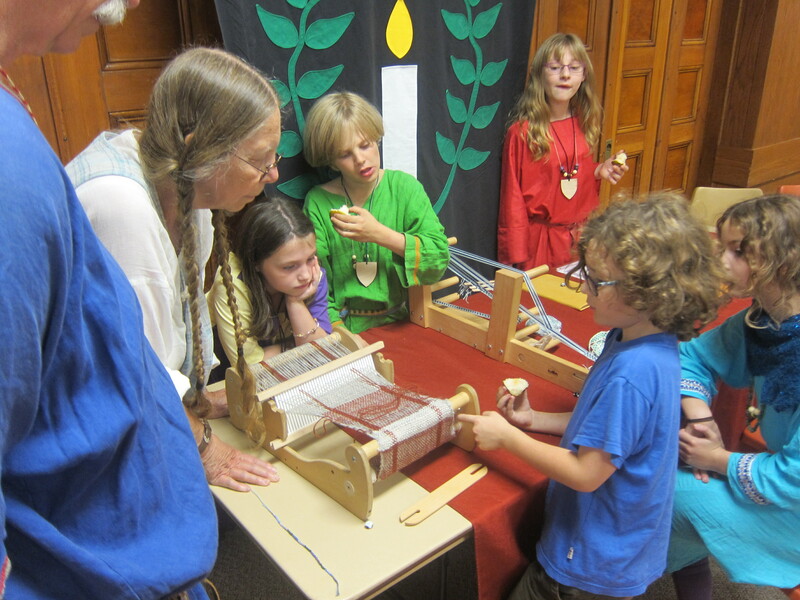 Konrad showing off his weaving on his Cricket loom to Mistress Rhiannon. Master Bedwyr Danwyn and Mistress Rhiannon y Bwa undertook the difficult task of coming to some sort of order in which the entrants could choose their price. Taking their task very seriously, they talked with each entrant while watched by an eager flock of kids, making sure to note each accomplishment while also gently teaching a trick or two to help their project grow. Master Bedwyr demonstrating smudge free illuminating. The concentration the gathered children exhibited while Master Bedwyr demonstrated to Simon how to prevent edge smudgings on his calligraphy by covering up exposed edges with a piece of paper was mesmerizing, and the eagerness everyone followed Mistress Rhiannon into the kitchen to do a burn test to learn if the yarn used to weave with was natural wool, or not, when Konrad could not tell one way or the other, was truly inspiring! 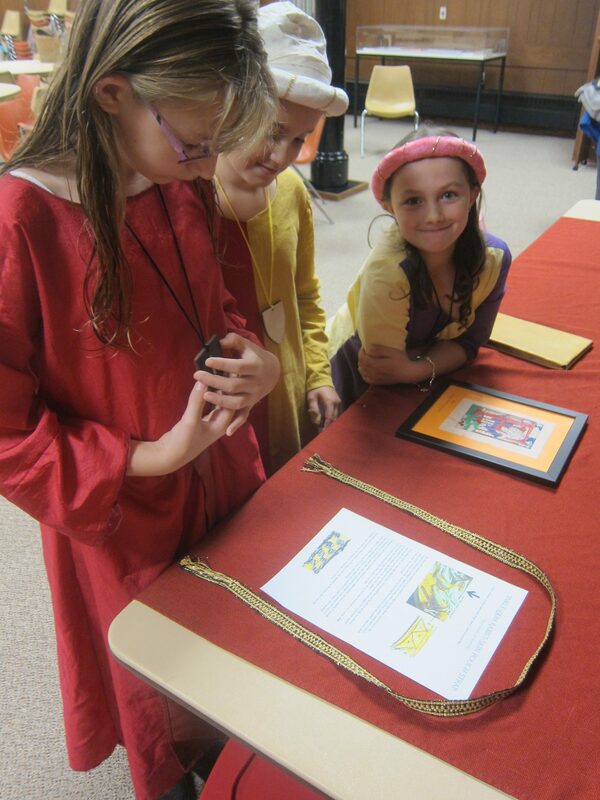 Cornelia showing of her entry to her sister Marie of Hartford and her friend Emma Wolthus. In the end, Cornelia won first pick with her inkle woven rabbit skin pouch strap, made with polyester gold thread. The rest of the kids quickly gobbled up the remainder prizes (there are never enough swords, we adults learned) and a good time was had by all. I overheard talk about what project to work on next and thought, what a great experience this was to inspire A&S into our new generation.